Celebrate with the Class of 2018! Join us at our 15th annual Senior Show & Celebration, when PCA&D’s Class of 2018 exhibits their Senior Thesis projects, the culminating work from the BFA program in fine art, illustration, photography, graphic design, and digital media. Many works are for sale during the show. This special day begins with Commencement ceremonies at the the DoubleTree Resort, and the Senior Show starts with a private preview for the graduates family and friends at 4 pm. 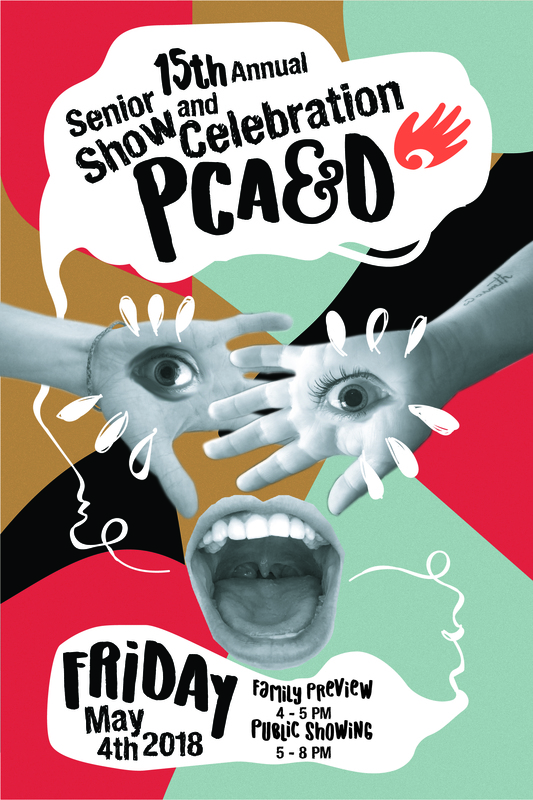 As is PCA&D's tradition, the event will feature a progressive dinner, which visitors to the Senior Show enjoy as they travel from floor to floor, with appetizers on floors 1, 2 and 3, heavier fare on the 4th floor, and dessert served in the atrium. Live music will be featured including David Wilson, the Mark Huber Duo, and Rue de la Pompe. The Senior Show & Celebration, often billed as the largest one day gallery event in Lancaster, is sponsored by Benchmark Construction (Celebration Sponsor), Atomic, M&T Bank, Upstage Video, Murray Securus, House of Pizza Lancaster, Jim Castanzo, J&J Heating & Cooling, LCSWMA, Fig Industries, Henrietta Heisler Interiors, Lemon Street Market, Barton Associates, Prince Street Cafe, Special Occasions, Rettew, S&T Bank, and Two Dudes Painting Company. Traditionally the Senior Show marketing design is selected from material submitted by PCA&D Seniors. This year’s design was created by Emily White, Graphic Design, Class of 2018. Emily was selected as runner-up in the Independent Cosmetic Manufacturers and Distributors (ICMAD) association’s 2018 Young Designers Award Competition for cosmetic packaging design.